A warrant has been issued for their arrest. “I assured his family that no one is above the law and that I would pursue justice on their behalf,” Mosby said during a press conference, her first public remarks on the case. Mosby said that medical investigators found that Gray’s fatal head injury had been caused by not being secured in the police van while handcuffed. The wound on the back of his neck showed that he had hit a bolt in the back of the van. By the time the police van reached the station, Gray was in cardiac arrest. He had told officers previously that he could not breathe and needed an inhaler, and had not been given medical assistance. Gray died a week later. 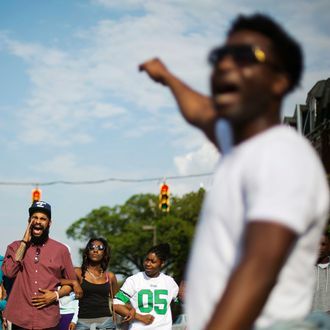 After the announcement, cheering and hollering could be heard at the intersection where most of the rioting took place earlier this week, as drivers passing by honked their horns. About 100 police officers in riot gear were there observing the cheering. Kevin Moore, who filmed Gray’s arrest, told the Baltimore Sun, "I’m exuberant. I’m happy. I’m every positive word you can think of. I finally made a difference in the world." It "feels so good," he added "that black people finally matter." Later in the afternoon, hundreds of people marched toward city hall in a mostly celebratory mood, chanting Freddie Gray’s name and "no justice, no peace." Maryland Governor Larry Hogan ordered more than a thousand National Guardsmen downtown, where there was already a heavy police presence. A police union in Baltimore wrote an open letter arguing that Mosby should appoint a special prosecutor in this case because of a conflict of interest. Her husband is on the City Council, and the Grays’ family lawyer donated $5,000 to her campaign and provided help during her transition. Fraternal Order of Police Lodge 3 president Gene Ryan also wrote that, "As tragic as this situation is, none of the officers involved are responsible for the death of Mr. Gray."